Sarah Potter gave us this photo. Thanks, Sarah. I had NO idea what this was (which goes to show you NEVER wake up at 4 AM to see what the prompt of the week is — you’ll get confused). Then, again, it isn’t what you’re looking at, either. Same for the story. It first appeared on March 26th, 2014. Have at! The two boys couldn’t wait to run out to the woods near the neighborhood. “Right. We can pretend to build a campfire.” They stacked sticks and twigs. 56 Responses to Send More Chuck Berry! I had to read it twice before I understood it. Good one! Thanks, Neil. I’m glad you got it. 100 words is a lot easier to deal with in the re-read, isn’t it? Did you see NASA just came out with a list of new planets discovered? Ought to be interesting. Ohhh, I like the sound of that. Great! That’s awesome. Love a space story from a different perspective. Love that they chose the names Kyle and Derrick too… So funny. Thanks, Jessie! It is. I didn’t intend it to be funny, but that’s fine, too. I like The Twilight Zone and this seems to be their kind of story. In fact, it was based somewhat on an episode, the idea, anyway. I can’t help but see Jeff Bridges saying “Red light stop, green light go, yellow light go…very fast!” Fun stuff. Yes, darn it. Pressed send , thought a bit then realised…should have gone back to change it! Or at least PS it! Oh please… I made a mistake. Starman! I’m sure they were hoping for a copy of “My Ding-a-ling” Too bad Perry isn’t here, I think he has they lyrics memorized. Memorized? That song would indicate he has two brains, neither of which work. Five out of five No Particular Place to gos. Beam me up, Scotty. Don’t pass go, don’t collect $200. I will always request more Chuck Berry too! No one does it like Chuck Berry. I met his piano player once. Pretty cool, don’t you think? Thanks for the clever chuckle. You’re welcome, Magaly. Might have turned out the probe was just a spittoon. Love this, though I never heard of the story. I wonder if it’s been decoded yet. Which story, Bjorn? The real Voyager or this story I wrote based on the Voyager? Oh yes. It is from an article in National Geographic back in the day or Smithsonian. But, you can find it on-line, I’m sure. I think it was Carl Sagan’s brain child. A different take on the space stuff. Well written. Fun story. I wonder what happens if this disk is ever found by another intelligent race. They’ll be singing “Johnny B. Goode” tonight. They won’t know what it means, but it’ll become a classic, I’m sure. Fun! Reminds me of the first Star Trek film. I think that was to do with Voyager “gone mad”. YES! Exactly. I love that movie. Quite a tale your giving us this week. I think music can connect us all even aliens with spacemen. Seriously, I’ll have some more cocktail party chit chat with my brother-in-law with all of this. He was head of security for NASA. Retired a few years ago. I think we saw the Voyager when we took a private behind-the-scenes tour with him. AND … they say you stop learning … HAH … never. BTW … your story was good. I sort of diverted a little. Muy buen fin de semana, amigo. Really? Your brother was head of security at NASA? That’s too cool! My uncle worked on the Gemini through Apollo projects back in the day. He delivered the payload and cargo to the center. He had been a career man in the Air Force from WW II through Korea. 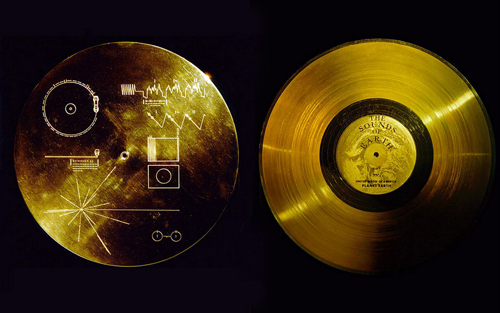 To see the Voyager, though, that’s pretty impressive. Tengas un al fin de semana excelente, también. He is still performing, would you believe it and has a new album out this year. This might be the year when the aliens try to get a ticket to the show. Yeah? I didn’t know Berry had a new album coming out. Dude’s 90! I think the aliens WILL get a ticket or so. I’m guessing that subjecting aliens to our music might be a bit of a hit and miss affair. Just think how, even in our world, one person’s choice of music is another person’s nightmare. Our music might actually result in the death of an alien, because it was on a frequency that cut right through its brain. I feel as if I’ll keel over sometimes, if I hear shrieking sopranos with imperfect pitch hitting a high note. That was the response of the old people when rock and roll came out. I wonder what record they would send today. Nicely done. Thanks! Hopefully they’d send same one. I was kind of wondering what other music they had aboard, but, hey. You can only fit so much into a small record. You can find the contents of the recording on Youtube. I love the idea of this, Kent. I’m with Loré: what would they send today? Such a delightful story, combining the idealism and creativity of children, and some interesting history.